After making your choices regarding package, faction, and planet, you get access to APEX. Welcome! Thank you for putting your trust in us. You can now begin setting up your base. Please note that the default layout screen may look different for you. On the Universe Map, you can see an arrow pointing at the system where your starting ships are stationed. If you do not see an arrow, check if there is a yellow bar next to the word “Fleet” in the Universe Map. If there isn’t, click it now to toggle on the display of your Fleet. If you want to set up your base right here, which is strongly recommended to new users, click “Construct Base” to see which building materials you need. If it says “missing” underneath some or all of them, click the dropdown menu and select the other ship Transponder code. One of your ships has the resources you need in its cargo hold. Next, choose an empty, grey Plot to place your base module on. Congratulations, you now have a base! Clicking “VIEW BASE” opens a buffer you are going to need a lot: your base overview. You may want to drag it into an empty tile right now. Hitting “Population”, you can see that there are no people in your base yet. Your workforce is divided into several levels of specialization, from Pioneers to Scientists, each with their own needs to stay nourished and active. 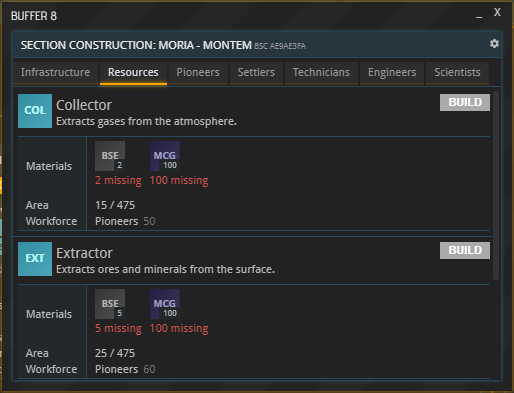 Opening up the BUILDINGS (formerly “SECTIONS”) buffer shows that there are no buildings in your base apart from the Core Module. That is why you first need to erect some structures for your workforce to live and work in. It is important to understand that the supply chain you decided to start with earlier – Farming, Metallurgy etc. – encompasses buildings in several of these tabs. As a general rule, the more basic buildings of any industry are operated by the lower-level workforces like Pioneers and Settlers, and the further you go to the right, the more advanced the buildings and their workforces become. Next, you need to find out which buildings are relevant to your company. This depends on the package you picked earlier. If you are new to APEX, you should stick with the structures that are recommended for your package below. You have been provided with the exact materials required to build them, which you will find in one of your ships’ cargo holds. 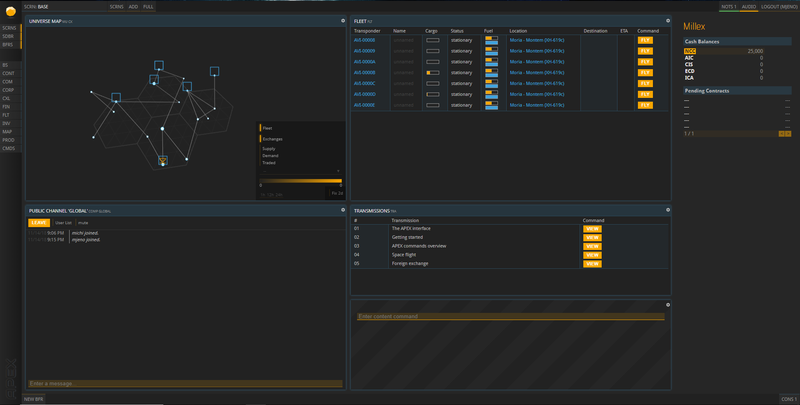 Select the FLT shortcut on the left and click the cargo spaces of your ships to find the materials. Then open your base’s Inventory from the BS window and drag and drop the materials into it from your ship. Regardless of your package, it is recommended that you also construct two “Habitation Pioneer” modules. 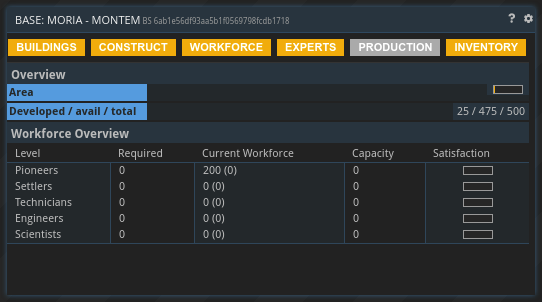 To construct a building, simply hit its “BUILD” button; if it worked, your new building will show up in the BUILDINGS (formerly “SECTIONS”) window you can access from your base overview. You have now successfully started your base with production buildings, worker habitation modules (including the workers) and some storage space. 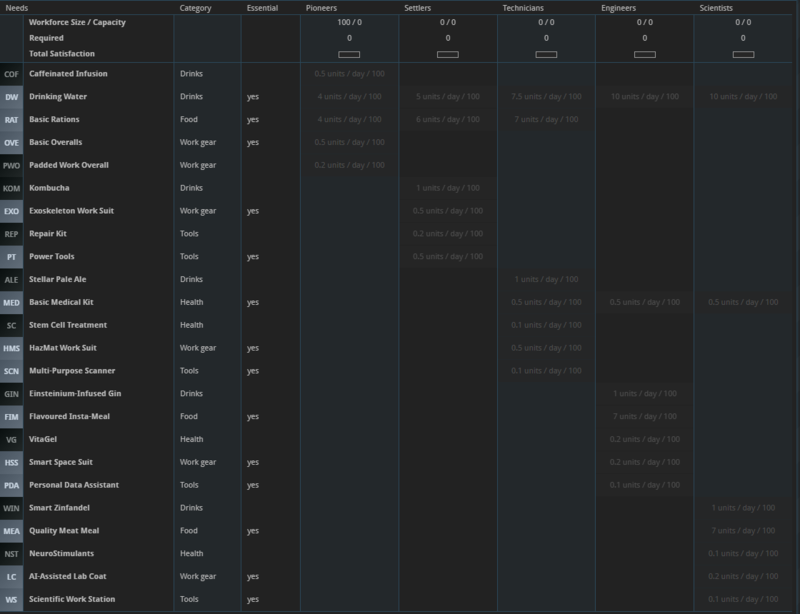 You are all set to begin producing and trading!